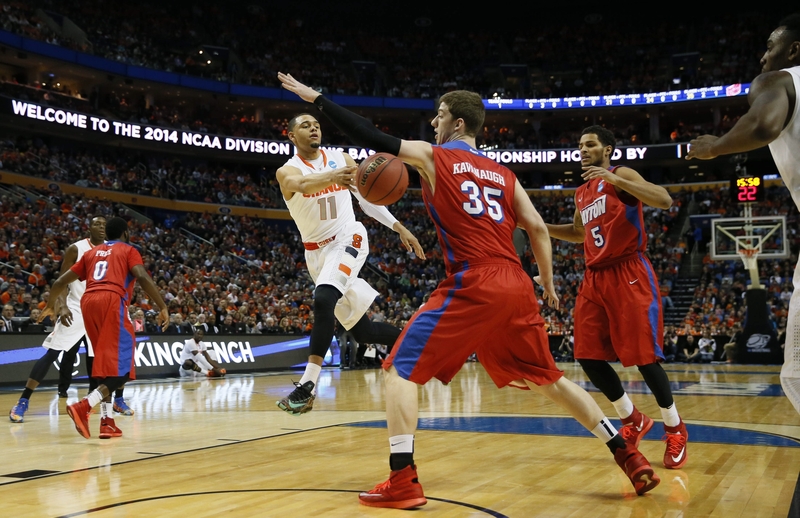 Syracuse’s Tyler Ennis passes the ball around Dayton’s Matt Kavanaugh in the first half Saturday. The Dayton Flyers knew they needed every break they could muster. The Flyers made the NCAA Tournament as the sixth and final Atlantic 10 team. They’re an 11th seed. But there they were, leading the mighty Syracuse Orange early tonight in First Niagara Center. The Flyers led by seven points 8:23 into the game and had chances to extend their lead, perhaps even dictate if they dared. Then came some turnovers, a couple missed layups, a blocked shot, some fouls, a missed free throw. Was Dayton flirting with disaster? With 2:47 left in the first half, that seven-point lead had evaporated. Syracuse had its first lead. “You’re playing against a great team,” Dayton coach Archie Miller said. “I mean, you’re playing against one of the best teams in the country, and to play them in Buffalo, to expect to push ahead, so to speak, it’s not really going through your head. In one mutually miserable stretch at the end of the first half and the start of the second half, Dayton had made only two of 14 shots from the floor, and Syracuse had made one of its last 12, including nine straight misses. Dayton hadn’t made consecutive shots the entire game to that point, Syracuse just once. Syracuse kept hanging around, though, and with so many Orange fans in the building, there was a sense its cache might come through at some point. Syracuse took its largest lead with 7:49 to play, when guard Tyler Ennis made a layup to go ahead, 40-37. Dayton retook the lead 91 seconds later on a pair of free throws and never trailed again, but Syracuse remained within striking distance until Ennis’ three-pointer rimmed out at the buzzer. “If you’d have told me at the end of the game, you’d have a one‑point lead with a minute or whatever, you’re taking it,” Miller said. “You’re just going to take that. Shabazz Napier leads Connecticut in every way possible, both on and off the court. Kevin Ollie would be lying if he said he saw that coming. Napier was a rebel when he arrived as a freshman in 2010-11. Kemba Walker was the big man on campus then. Though Walker led the Huskies to the national title, he still had to battle the new guard on the team. “When I first started working him out, he was telling Kemba what to do,” said Ollie, who was an assistant coach then. “I was like, ‘What’s this little freshman telling Kemba where to shoot at?’ He was seeing how he was leading, but he still had a little rebellion in him a little bit, wanted to do it his own way. Napier may have an NBA future ahead of him, but he’s a rarity in that he could go pro while staying in school for four years. The college life allowed him to grow from the wild kid to the mature Player of the Year in the American Athletic Conference. He’ll try to become a Sweet 16 player tonight when UConn faces Villanova in First Niagara Center. The “Freshman 15” wouldn’t have worked for Kris Jenkins. The forward arrived at Villanova weighing about 295 pounds, so the fabled weight gain during the first year of college would have put him over 300. There’s no way a 6-foot-6 shooter can compete at the top NCAA level at that weight. So while his fellow freshmen put on pounds, Jenkins lost them. “Forty pounds,” Wildcats coach Jay Wright said. “He’s lost 40 pounds. He worked so hard. “He made great improvements from the summertime until now with dropping weight and getting his body to where it needs to be to compete at this level,” Villanova guard Darrun Hilliard said.